Selective Naturals Grain Free is blended with temptingly tasty Timothy Hay to help promote the good health of rabbits. High in fibre and grain free, Selective respects the natural diet, with this delicious recipe that includes essential forage and garden vegetables. It supports digestive well-being and has all the vitamins and minerals rabbits need to help keep them in the very best of health naturally. Kind to teeth with no added sugars or artificial colours, Selective Naturals Grain Free is blended with natural linseed, to help promote clear skin and a glossy coat. on activity and other factors. Adjust feeding quantities according to your rabbit’s body condition. Always offer unlimited fresh drinking water. 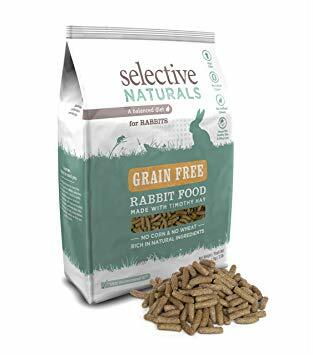 There are currently no questions for Selective Naturals Rabbit Grain Free - be the first to ask one!